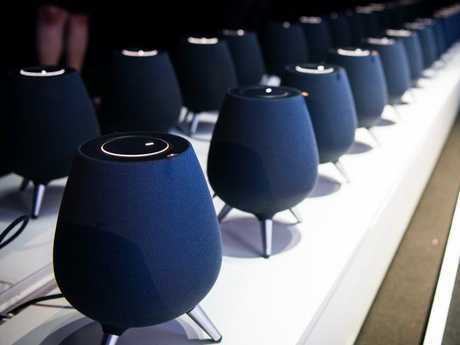 Samsung's new voice-assisted speaker, the Galaxy Home, is displayed during a product event in New York. Picture: AP. The company's first speaker powered by voice assistant Bixby is designed to deliver music first and answer questions second, just like Apple's HomePod. But, in a coup against its major rival, Samsung revealed it had partnered with the world's biggest music-streaming service to launch its new product. The Galaxy Home is designed to deliver music first and answer questions second. Picture: Jennifer Dudley-Nicholson. Samsung product marketing senior director Drew Blackard announced the company's new deal with Spotify, which boasts more than 70 million paying subscribers, stressing the relationship was designed as a "meaningful, long-term commitment". "We had to make sure that they share our values and are committed, long term, to helping people enjoy music in new ways," he told the audience at Brooklyn's Barclays Center. "Luckily for us and, more importantly, lucky for you, we found the perfect fit." As part of the new deal, Spotify will create apps for several Samsung smart products, including appliances, chief executive Daniel Ek said. "Samsung makes devices for every aspect of our lives; really everything from smartphones to TVs, to tablets, speakers, watches, and even refrigerators," Mr Ek said. Samsung partnered with music-streaming service Spotify to launch its new product. Picture: Jennifer Dudley-Nicholson. "And we have designed Spotify to deliver personalised music to customers around the world, wherever they are, and on as many devices as possible. It's a really great fit." 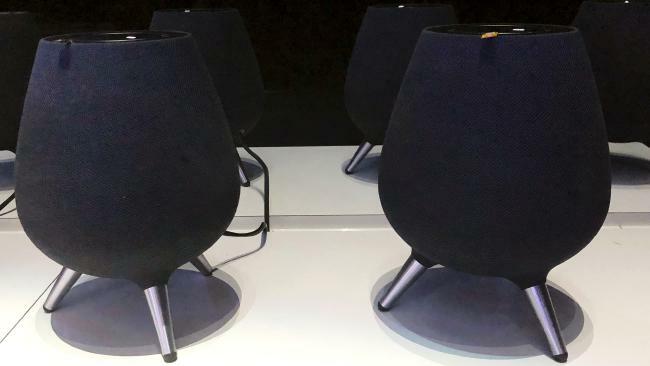 While Samsung revealed few of the finer details around its Galaxy Home speaker, it's understood that it will feature full-range speakers designed to produce sound in all directions, a subwoofer, and audio tuning from AKG. The speaker will also use eight microphones to register questions from users to its voice assistant Bixby, which the company said had recently received an update to understand more "conversational" queries. However, the speaker's unusual form, with something of a wine glass-top and three legs, has already been unflatteringly compared to a Weber barbecue and a witch's cauldron by online commentators. 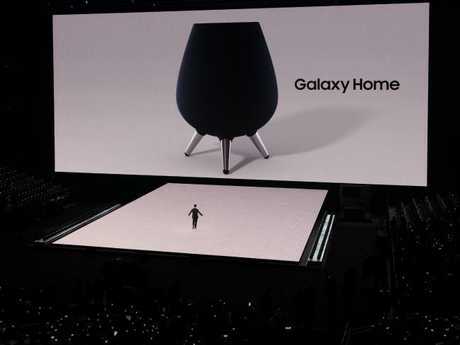 The Galaxy Home’s look has been likened to a wine glass-top with three legs. 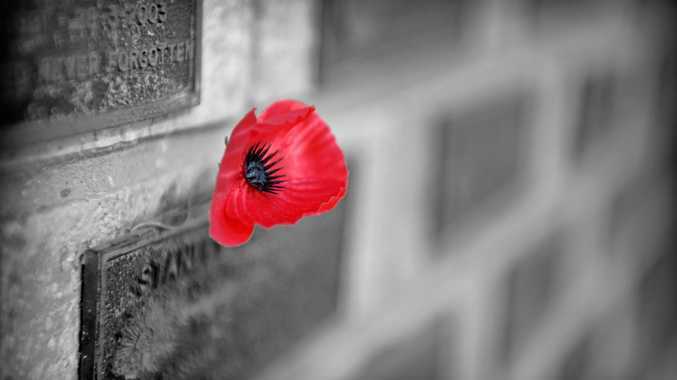 Picture: Jennifer Dudley-Nicholson. 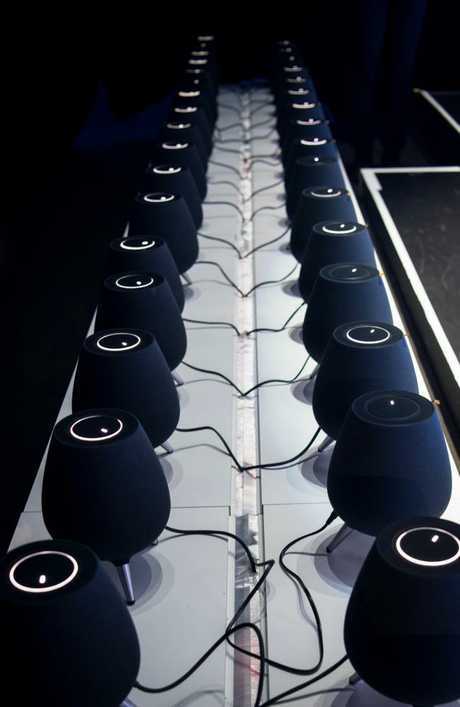 Samsung Electronics confirmed the Galaxy Home would be launched in Australia, though did not reveal a date. "Pricing and availability will be announced closer to the Australian launch," the company said in a statement. But Samsung will face stiff competition in the smart speaker market. A recent Canalys report found Google and Amazon dominate more than 60 per cent of smart speaker sales worldwide, followed by speakers from lesser known Chinese firms Alibaba and Xiaomi. ***Jennifer Dudley-Nicholson travelled to New York as a guest of Samsung.